Home Crucible Is Nameless Midnight The Best Scout Rifle For PVP? Nameless Midnight is, on paper at least, a middling weapon when it comes to effectiveness. However, its stats and perks have been built so that while it might only look like an average sort of gun when you read about it, it’s pretty damn lovely in your hands and on the battlefield. Let’s have a look at those stats. This weapon fires 180 rounds per minute, has an Impact of 62, Range of 46, Stability of 44, Reload Speed of 50, and Handling of 47. the hidden stats are a Zoom of 20, Inventory Size of 46, Aim Assistance of 62, and Recoil Direction of 79. Like I said, you can draw a line down the middle of the stats bars on any weapon and it will reflect what we’re seeing here in Nameless Midnight. Even the hidden stats are quite low, though the Aim Assistance is incredibly useful for working with some of its Perks. Speaking of which, let’s look at those Perks. This weapon has a Precision Frame which makes the recoil pattern more predictable, and therefore slightly easier to handle. You have the choice between the following sights; Red Dot 2 MOA, a snapshot sight that slightly increases Range and Handling Speed, Red Dot Micro, an agile sight that increases Range and Handling Speed slightly more, or Rifle Scope SSF, a focussed long-range scope that slightly increases range while decreasing Handling Speed. Of these sights I’d go fo the Red Dot Micro because it has the best stat boosts, and it’s still a sight with some decent range that doesn’t make the weapon into a sniper rifle. Next you can choose from; Flared Magwell, which slightly increases Stability and greatly increases Reload Speed, or Steady Rounds, which greatly increases Stability with some Range reduction. Of these I would opt for the first one because you’re not losing any stat numbers. However, I understand that Stability is more important to some people than others and for those people I would suggest the second Perk. The final Perk is of course Explosive Rounds. This Perk makes bullets create an area of effect detonation on impact. Not only does this make you bullets feel like they’re impacting harder to the enemy, they end up dealing more damage because of the confusion and frustration they cause, if not thanks to actual improved ballistic damage. 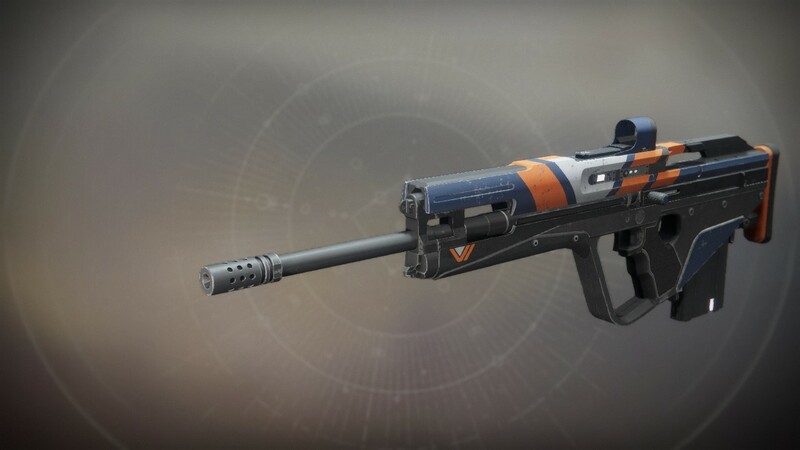 Ultimately this weapon is still just an average Scout Rifle, but if you use those Perks to make it suit your play style you can pop the heads off of enemy Guardians at any distance, becoming an effective killing machine. Let us know what you think of the weapon in the comments.